The great spring weather has everyone in southwest Florida heading outdoors! Spectacular Spaces was happy to be included in Beth Luberecki's article in the March/April issues of Times of the Islands and Bonita Living magazines. Check out the tips below for making the most of your outdoor space. 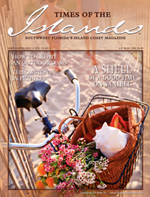 Chances are, you might be flipping through this very magazine while sitting on your lanai or balcony. Take a look around. Is your outdoor space the alfresco oasis it should be, or could it use some work? Living in Southwest Florida, we’re lucky enough to be able to spend a lot of our time outdoors. But who wants to spend that time in a ho-hum, unfinished space? So what are the secrets to creating a space that’s both fun and functional, whether it’s a tiny condo balcony, spacious screened-in porch, or expansive pool deck and lanai? Start out by determining how you’d like to spend time there. Want to come home to a spectacular space? Contact me! Refresh for home and spirit. | Is it time to call a professional? | Decorating tips for a happy home. View extensive list of all past blog posts in Archive. Refresh your home for spring! Springlike weather has arrived in southwest Florida, and this is the time of year that most of us start thinking about what we can do to our homes to spruce them up a little for a new season. Although we don’t really have a change in seasons, even in Florida, it is fun to make a transition from the winter months into spring. So, if your home is in need of a little decorating magic to give it a new look for spring, check out the tips below from our latest News-Press Column. Start at the front door. Paint the door a fresh, new color. Purchase two ceramic pots which you can leave as they are or paint them a beautiful spring color and put them at the entry. Or to save money, buy plastic pots and paint them. Fill them with seasonal flowers. • Think about color. Maybe an accent wall that you have wanted to try. Or perhaps you would like to replace a color in a bathroom with a beautiful white and give it a spa look with all white accessories. Or add some color with a new set of towels or sheets. • Rotate your artwork. Everyone has too much art. Keep some of your favorite pieces and switch them out. Spectacular spaces recommends doing this seasonally. And while you are thinking about art, do some rearranging to give your walls an art gallery look. Hint: Less is more. • Rearrange and regroup. Too many collections scattered around? Or maybe your taste has changed. Don’t be afraid to eliminate something that you no longer love and open a space for something new and wonderful. • Declutter. Get rid of anything that you do not love. This one alone will make a world of difference. • Lighten up. Evaluate your furniture. Is it too heavy for the room? Think about replacing cumbersome pieces as your budget permits. This is the time of year in southwest Florida when we eagerly await any sign whatsoever of a change in seasons. Although temperatures are dropping and leaves are turning in other parts of the country, we are still basking in the summer sun. Instead of picking up beautiful leaves for arrangements, we are happily picking up shells on the beach. But long for a peek at fall. Spectacular Spaces offers affordable interior decorating in Bonita Springs, Estero, Fort Myers, Fort Myers Beach, Naples, Sanibel Island, Captiva Island, Cape Coral and Pine Island. © 2019 Spectacular Spaces. All Rights Reserved. Spectacular Spaces offers affordable interior decorating services in Bonita Springs, Estero, Fort Myers, Fort Myers Beach, Naples, Sanibel Island, Captiva Island, Cape Coral and Pine Island.